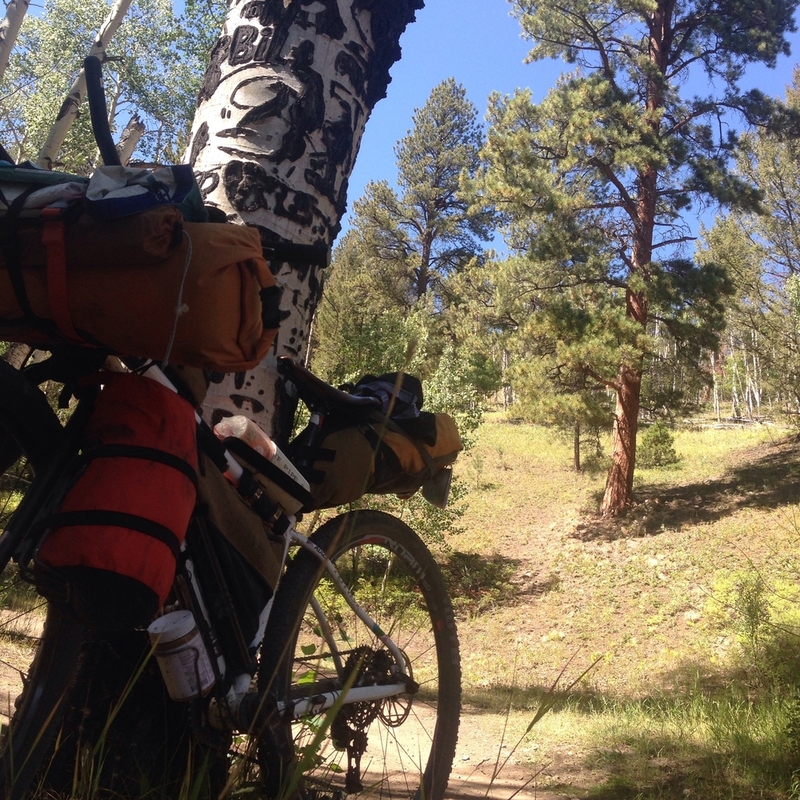 Figuring out what to take on a bikepacking trip is all about figuring out how comfortable you want to be, and how many compromises you want to make depending on your priorities. If your priority is going fast, you'll make comfort sacrifices and bring less. If your priority is enjoying the scenery and being somewhat comfortable, you'll want to bring more gear. Simple, right? I've done a little research in the comfort versus lightweight arena. This post is an overview of some personal trial and error experiences that have led to me ditching some gear, keeping some gear, and mailing myself back gear that I previously ditched. Yep. That happened. Here's a picture of what I left behind in Colorado. Things I left behind... The stove I would ask to me mailed to me later. 1. Garmin eTrex20 - the Gaia app on my iPhone works so well that I NEVER pulled out the eTrex. So I finally sent it back to Garmin to have the basemap restored, and then just had them send it home. 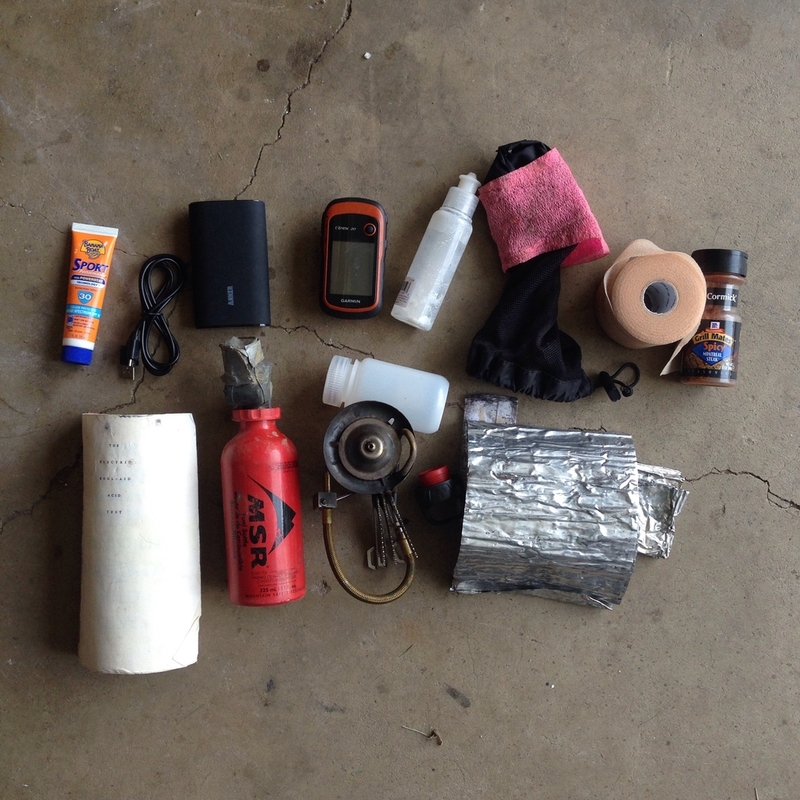 (If you read the post on navigation you'll get a glimpse of my frustration with Garmin). Note that my generator hub is a crucial component that makes the smartphone GPS app possible. I have not yet had a problem with my iPhone overheating and shutting off, and don't anticipate it to be a problem. As a backup, the ACA maps are really accurate, and I always keep track of mileage on the odometer. Hence, the $200-something eTrex finally went home. This is the only sign I've seen on the entire trail, but staying found is actually relatively easy... Especially compared to 5-8 years ago. 2. Anker backup battery (9600mAh) - Okay, so I know that amp-hour capacity of this battery is huge. But at the time I bought it, I thought I'd be supplying power for two phones and some devices. (Myself and a riding buddy.) But when you're riding a bike all day and don't have service, there's not much to do on your phone anyway. I'm finding that I can keep my phone, my Omaker speaker, and someone else's phone charged for functional in-the-wilderness use. (Read: NOT flicking through Instagram 10x a day.) I used the battery once in 1700 miles in a non-crucial way, so I left that behind too. New Mexico may require more cautious battery usage as there are less long downhills and flats and more frequent rocky rollers, but I think it should be fine. One of the super important things I keep charged with just the generator hub; no backup battery needed. 3. Extra sunscreen - I bought a regular ol ball cap so it shields my nose/face, and now I don't have to reapply fifteen hundred times a day. It's not the coolest look, but I'm pretty much keeping the company of sage brush and other dirty bikepackers. (Read: doesn't care.) Also, I rotate between sleeveless and fully sleeved shirts every other day to avoid getting super burned arms. The legs, well, I'm trying to get them as tan as possible. 4. The MSR International Whisperlite Campstove - One of my prized backpacking possessions. This is the most versatile stove out there, and its users are loyal. I'd been using gasoline for fuel, which is super cheap and ubiquitous - unlike many stoves that require very pure fuel. My friend Damien had brought along the Esbit tablets to boil water. I was impressed with the convenience and thought I'd try to ditch the stove for my solo ventures. The idea was that I could carry more food if I didn't have a stove, and that I would just eat more ready-to-eat foods. The Whisperlite in action in Wyoming. So cute. I should've known better. The Esbit is somewhat brilliant in approach, but for a loyal Whisperlite Int'l fan like myself, I am asking for my stove back after 2 weeks of traveling without it. Second, they don't get hot enough to boil water at higher elevation. I'm not sure what the exact cutoff elevation is, but for most of Colorado and northern New Mexico (above 7,000'), my water has been warm, not boiling, which is not the biggest deal ever, but.... just, meh. I'm a WL snob. Third, I didn't end up with much more food anyway. I put a jar of almond butter in my bottle cage (pretty awesome tho), and took a bunch of tea instead of the stove. I loved having the almond butter so accessible and out of the way, but it just wasn't worth it. The stove is small enough to fit in my cook pot, which is hardly a compromise when it means having boiling water anywhere using a cheap source of fuel. So, if you're intent on going super fast on your bikepacking trip (read: shredpacking or racing), taking a MSR WL stove isn't crucial. For dinner you can eat tortillas and cheese or ramen or space food or or snickers or really anything that only requires warm water or no water to eat. But if you're trying to enjoy some comforts on a trail that can get pretty remote, bring a stove. So there it is. As an aside, I'm collecting data on how the SON 28 40 does in terms of keeping a phone charged... Hopefully I'll have something useful to say about that when I'm finished with the trip.